The Miniature Australian Shepherd (North American Miniature Australian Shepherd) has a medium-length coat. It comes in blue or red merle, red or black tricolor, all with white and/or tan markings. The hair around the ears and eyes should not be white. The coat may be straight or slightly wavy, and should have feathering on the back of the legs, and a mane and frill around the neck. Hair on the head, front of the forelegs and on the outside of the ears is shorter than the rest of the coat. The hindquarters are the same length as the forequarters. The top of the skull is quite flat and clean cut. The feet are oval and compact. The lips do not hang over the lower jaw. Miniature Australian Shepherds are easygoing, perpetual puppies that love to play. Courageous, loyal and affectionate, they are excellent children's companions that are great with active children. A devoted friend and guardian. Very lively, agile and attentive, they are eager to please with a sixth sense about what the owner wants. Miniature Australian Shepherds are highly intelligent and easy to train. They can become nervous and destructive if left alone too much without enough mental and physical exercise. They need a job to do, as the breed is very intelligent, active and thus easily bored. Socialize your dog well when it is a puppy to avoid it becoming suspicious of strangers. Some like to nip people’s heels in an attempt to herd them. They need to be taught herding humans is not acceptable. A fine companion, it also enjoys working small stock. They are quiet workers. This breed is not usually dog aggressive. Make sure you are this dog's firm, confident, consistent pack leader to avoid Small Dog Syndrome, human induced behavior problems. Always remember, dogs are canines, not humans. Be sure to meet their natural instincts as animals. There is overlap in wieght as a stocky Toy might weigh more than a slender Mini. 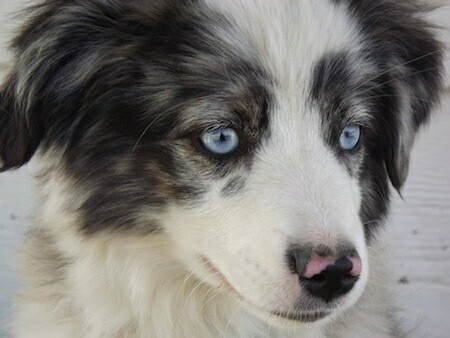 The gene for the beautiful merle coloration also carries a blind/deaf factor. This may be expressed only in merle/merle crosses. 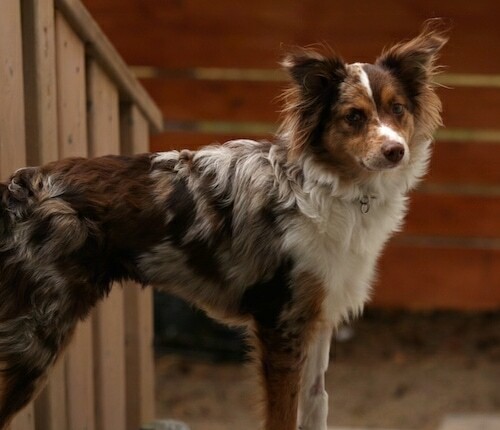 The vast majority of merle North American Miniature Australian Shepherds are heterozygous merles (one parent is merle, the other is solid) and these merles are not at risk for any special health problems due to their coloration. Be sure to check the hearing on merle puppies. Hip and eye problems can occur. Ensure sire and dam of puppies have been tested and are certified clear prior to purchasing a puppy. Some herding dogs carry a MDR1 gene which makes them sensitive to certain drugs that are otherwise okay to give another dog, but if tested positive for this gene can kill them. The Miniature Australian Shepherd will do okay in an apartment if it is sufficiently exercised. They are moderately active indoors and will do okay with a small yard. This breed will do well in cold climates. 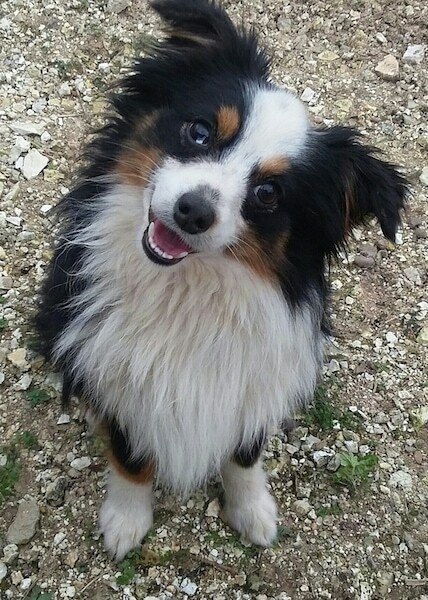 The Mini Aussie needs to be taken on daily, long walks. This energetic little dog needs plenty of vigorous exercise to stay in shape, or better yet, some real work to do. The coat of the Miniature Australian Shepherd is easy to groom and needs little attention. Brush occasionally with a firm bristle brush and bathe only when necessary. This breed is an average shedder. A breeding program to develop the Miniature Australian Shepherd (North American Miniature Australian Shepherd) was begun in 1968 using small Australian Shepherds. Breeders bred them down in size to produce a smaller dog and today continue to strive to produce a mirror image of the Australian Shepherd in a size that fits well into today's lifestyle, without sacrificing instinct, ability or character. The major club in the US is the Miniature Australian Club of the United States of America. MASCUSA, as the parent club, has petitioned the American Kennel Club for inclusion in AKC. The process of acceptance into AKC starts with registration into the AKC Foundation Stock Service. The Australian Shepherd Club of America has accepted the Miniature Australian Shepherd ONLY if the Miniature changes its name and has no reference of any kind to the Australian Shepherd or its history. 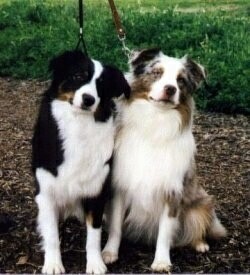 A lot of Miniature Australian Shepherd owners are registering with AKC FSS. The AKC's official name is Miniature American Shepherd. "This is Lewis, also known as Lewey shown here at 1 1/2 years old. He is a jovial, good tempered dog and a fine companion. He is very intelligent and endearing. I have never seen a livelier, bouncier dog! He weighs about 10 pounds and has a small fleck of blue in one eye. Lately he had been helping our daughter with "herding" chickens back into their pen. " 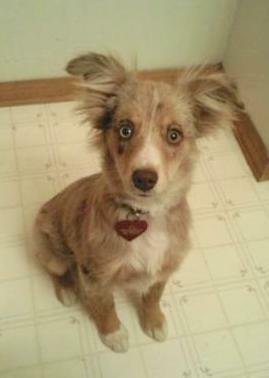 Vera the Mini Australian Shepherd at 6 months old—"Vera has a great personality. She is very keen and loves to play fetch. She is a great dog." 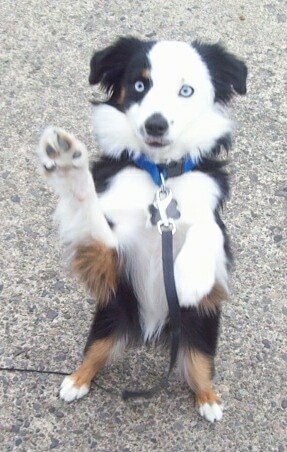 This is Roo the blue-eyed Miniature Australian Shepherd from Wee Mini Aussies of Southern California at 8 months old. 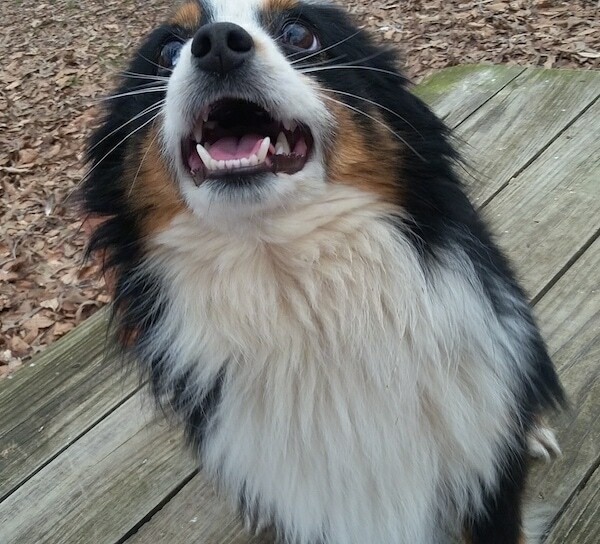 "Zoe is a Toy Australian Shepherd. She is almost 9 months old in this picture. She is a very active little dog, and smart too! She will only do the tricks I've taught her if there is food involved. She loves to play with our cat Simba and our two-year-old Pug Bindi. Zoe loves to play with mini tennis balls, and would rather chew the carpet then a rawhide chew bone, which is one of her bad habits, along with climbing on my daughter's tiny picnic table and stealing food. In the picture Zoe is "waving," one of her newer tricks." "This is my Toy Australian Shepherd puppy Jaxi. She is 4 1/2 months old in this picture, weighing 11 pounds."